Torchwood: Revisiting GREEKS BEARING GIFTS | Warped Factor - Words in the Key of Geek. Tony’s just popping to the gift shop. Ever wondered what people really think of you? Not what they tell you to your face, or what they say because it’s socially acceptable, but the real, miniscule, unbidden, ungovernable flashing impulse-thoughts you generate in people – friends, lovers, strangers – every, single, day? It’s the kind of question about which there really should be a Greek myth, or a fairy story, and now, thanks to Toby Whithouse, there is. Much is made in the story of the fact that the gift of hearing the thoughts of everyone around you is ‘not like reading their diary,’ but in point of fact, it is – if you’re going to read someone else’s private thoughts, you have to be prepared for what you find, whatever it might be. Tosh isn’t ready, because in all fairness to her, it’s not curiosity, or jealousy, or any dark motive that pushes her to accept the gift given to her by ‘Mary,’ the scavenger of alien knick-knacks who works her way into her life, her bed and her mind. Tosh is simply lonely, in need of someone to tell about the things she does and the things she thinks about all the incredible alien finds she encounters. She takes the locket of ‘Philoctetes’ just to find some scrap of positivity, some human thread of goodness in a world that too often seems too cold, too insular, and too self-revolving to feel anything much at all. 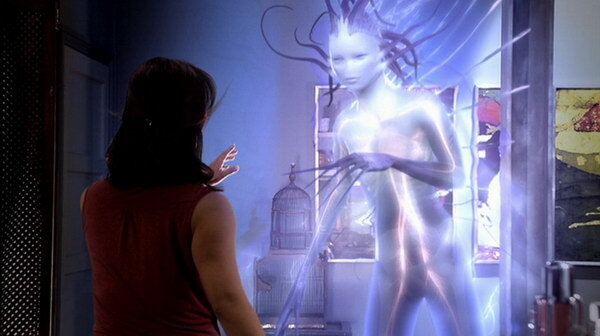 The idea of an alien befriending a lonely member of Torchwood in an attempt to get a piece of their equipment back, and then pursuing a campaign of emotional manipulation against them is powerful material, and it calls great performances from Toshiko actress Naoko Mori, from Daniela Denby-Ashe as ‘Mary,’ and in fact from all the Torchwood 3 crew, as they play themselves, while being aware of the thoughts going through their heads at any moment, and playing those too, simultaneously. As you’d expect from Toby Whithouse, there’s a strong central sci-fi mystery at work here – bodies that seem to be missing their hearts, going back hundreds of years, which give Owen plenty to frown about, and which pay off the story at the end in a logical, satisfying way. But really, the meat of the story is wound into two strands with Tosh at their centre: how lonely people can become needy people, and go on to be wound around the fingers of manipulative partners irrespective of their intellect; and the idea of knowing what everyone is thinking – the combination of banality and malice, the drudgery of the everyday with occasional flashes of genuine human darkness that fills a human head on any given day. Coming on the back of Countycide, the whole Torchwood crew is raw when it comes to needing some sign of human goodness and warmth, some moment of connection – as played out in the fling between Gwen and Owen here. Tosh, looking for that redemption of the human spirit, finds nothing but a dirty grey river of banality. Except with ‘Mary.’ Mary who, despite her defences, opens Tosh up to new experiences, to pleasure, to the connection with someone that makes us glow. Denby-Ashe turns in a truly mesmerising performance as the alien who gets under Tosh’s skin, importantly being entirely bright, and comfortable and seductive in and of herself, so Tosh doesn’t come off in this story looking desperate, or sad. Denby-Ashe’s performance, matched with Whithouse’s writing, makes us understand that were we in Tosh’s position, we too would be seduced by this stranger. We wouldn’t lose our rational mind, wouldn’t change who we were, and yet at the same time, the presence of someone like ‘Mary’ would be enough to make many of us suggestible, biddable, might lead us step by step into her web. This episode also gives us that rare thing – a window into Tosh’s world. For most of the run of Torchwood, she was the reliable one, the good girl, the computer whizz, the tech genius. Greeks Bearing Gifts shows us different sides to Tosh’s personality – her need to talk about Torchwood coming out when she’s drunk (a device re-used even as recently as The Torchwood Archive from Big Finish); her life outside of work, such as it is; her actual needs – most especially the need to find some thread of simple goodness, of caring, both in humanity and throughout the universe. That’s the need that, for instance, when she hears a potential murderer’s thoughts, forces her to follow him and stop him before he can do the deed. But it’s also the need that lets ‘Mary’ weave her web around her, manipulate her emotions and her thoughts, to the point where Tosh crosses the line and lets the woman she by then knows is an alien into the heart of Torchwood. While Owen has his moments in this story, working out the secret of the missing hearts, it’s Jack of course who ultimately puts paid to Mary’s murderous spree through history. There’s a lesson in there, but, unlike Tosh, you have to be willing to find it and accept it for what it is. There probably is that thread of goodness and hope in humanity, but it’s often overwhelmed by the needs of the everyday. And Jack could stand the truth of humanity and the universe, whatever it turned out to be. His unique perspective makes him a little less than human, a little more actually in sync with Mary, using who and what he needs throughout the course of his long life to do what he thinks is right, irrespective of the cost. There’s something cold in that resolve, that ability, that wasn’t in Jack when we first met him in Doctor Who. It’s the long perspective of an immortal, a vampire, a god. Tosh would never want that strength, that power. Tosh, along with Ianto and Gwen, is still in touch with her frailty, her emotions, her need for there to be some good in the universe, some prospect for love, rather than only pain and emptiness. Those emotional needs keep her human, but, like anyone who still can fall in love, they also make her vulnerable. Knowing that is not easy, but ultimately, that’s the true gift of ‘Philoctetes’ – knowledge not only of what other people are thinking, but knowledge of the self. As she reaches the still very responsible decision at the end of Greeks Bearing Gifts to destroy the pendant that could let her stop wars, stop murders, save the world one person at a time, we know we’ve been let in to the person behind the genius, to the beating heart of Toshiko Sato. That’s a precious gift indeed.